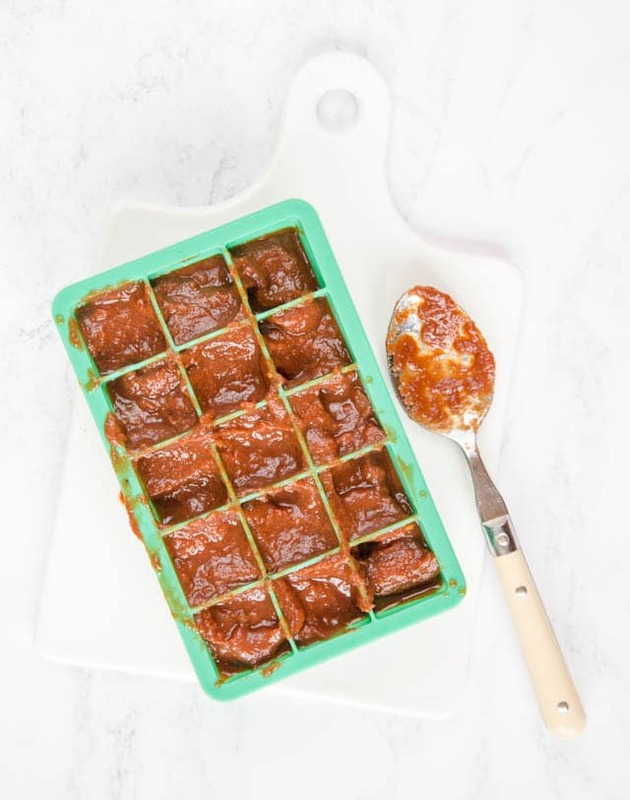 This throw it all in and forget it recipe for a rich and intense fat free slow cooker marinara or tomato sauce will become a freezer staple. Perfect for pizzas or pasta, it’s a simple slow cooker recipe that delivers scrumptious results every time. Gluten free and vegan. I’m a big fan of preparing ahead and freezing, finding that for meals during the week having something prepared earlier sitting in the freezer really cuts down on my stress levels and lets me make a healthy and tasty dish in no time at all. 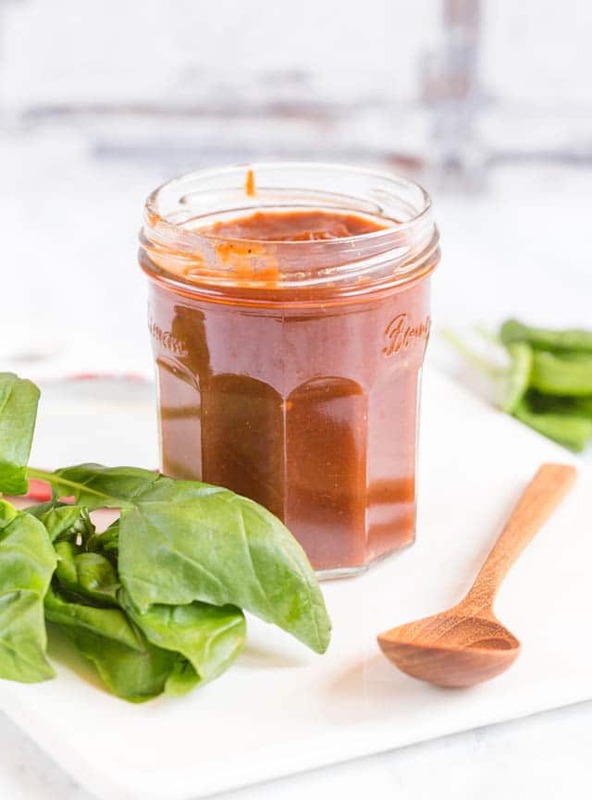 This slow cooker fat free tomato sauce is a perfect example, and has so many uses. 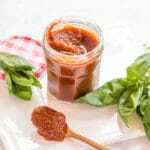 This tomato sauce is frugal, rich and intense and will become your favourite tomato or marinara sauce in no time. Best of all the preparation is almost completely hands off – you need to do a little chopping then chuck everything into your slow cooker, pop the lid on and leave overnight. Long slow cooking will reduce the canned tomatoes to a rich and intense sauce. To intensify the flavour even more leave the lid of the slow cooker ajar for the last hour of cooking time. One huge advantage of making a recipe like this in the slow cooker is that it really does not matter if you leave it coking for an extra hour or two. How do I make Fat Free Slow Cooker Tomato Sauce? 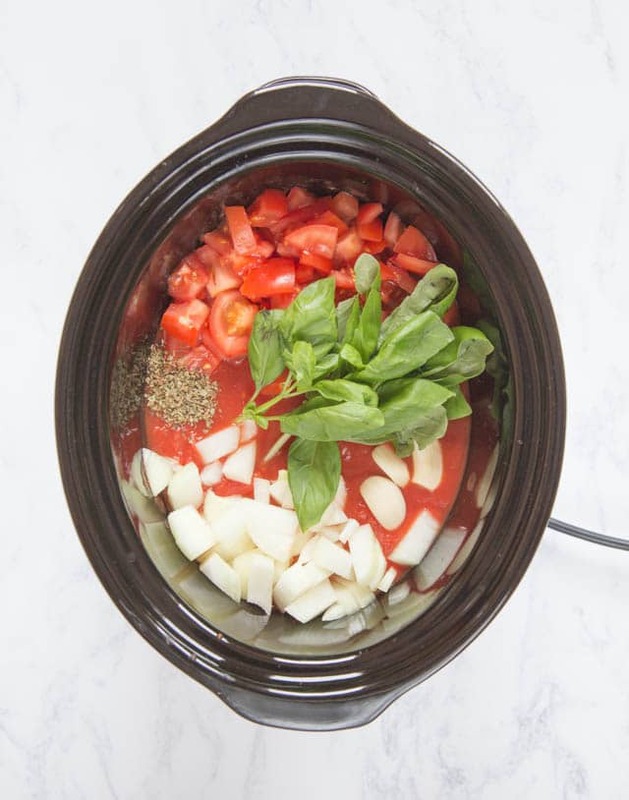 Can I Make This Slow Cooker Tomato Sauce Without A Slow Cooker? Can I Freeze Fat Free Slow Cooker Tomato Sauce? This is a very straightforward and easy recipe. There’s no no need to spend time spent frying onions or anything like that: simply place all the ingredients in a slow cooker and switch it on the low setting. Eight hours later, blitz the sauce with a stick blender and it’s all done. Use there and then, or let it cool and freeze it for later. Easily! Use a heavy casserole dish with a lid, and cook the sauce for a couple of hours on the lowest setting on your stove top. You may need to use a diffuser plate under the pot depending how how much control you have over the burners, and give the pot a stir from time to time. Yes, absolutely! What I like to do is to freeze it in an ice cube tray, then transfer the frozen cubes into a plastic bag. That way it’ll keep in the freezer for a few months, and it’s so easy to pull a couple of cubes out, let them defrost and stir into some pasta for a fuss free meal. Fry some mince until browned, add the tomato sauce and let it heat through. Spag bol in minutes! Cook some spicy sausages, add tomato sauce and serve with delicious buttery mashed potatoes. Add a cube to stews for a hint of rich tomato flavours. 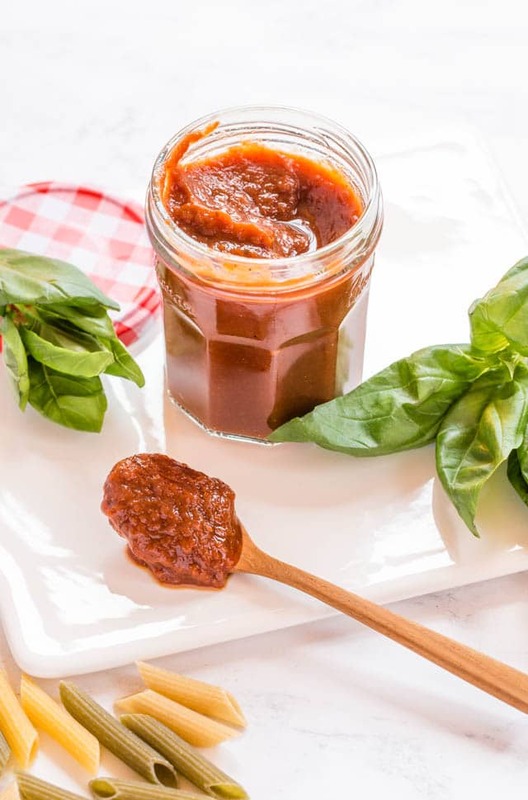 If you try this Fat Free Slow Cooker Tomato Sauce (Marinara Sauce) – Perfect for Pasta or Pizzas (Gluten Free, Vegan) please tag #FussFreeFlavours on Instagram or Twitter. It is amazing for me when for me when you make one of my recipes and I really do love to see them. You can also share it on my Facebook page. Please pin this recipe to Pinterest too! Thanks for reading Fuss Free Flavours! 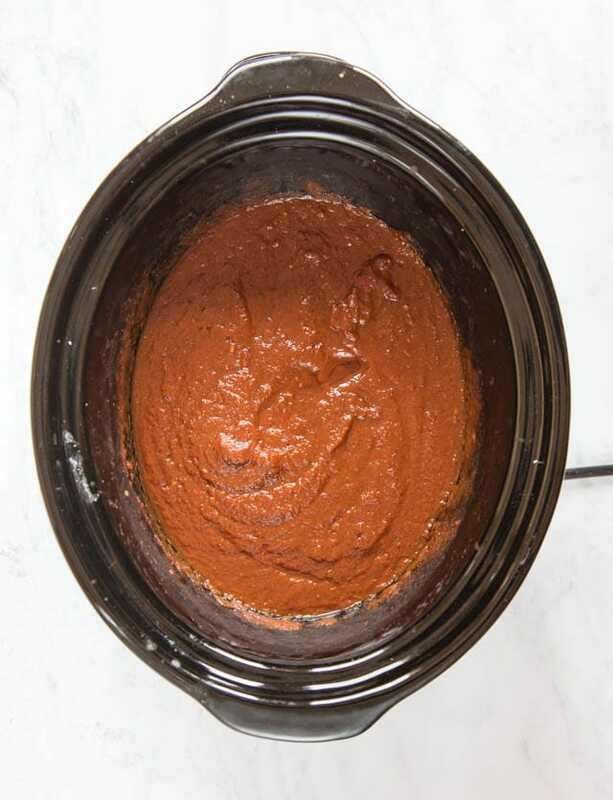 This throw it all in and forget it recipe for a rich and intense fat free slow cooker marinara or tomato sauce will become a freezer staple. Perfect for pizzas or pasta, it's a simple slow cooker recipe that delivers scrumptious results every time. Gluten free and vegan. Simple pop all the ingredients into your slow cooker, and stir. Cook on low, with the lid on, for about 8 hours or overnight. If needed cook for another hour or two with the lid of the slow cooker slightly ajar to reduce further. Blitz to a smooth sauce with a stick blender. Allow to cool before packing into tubs, glass jars or ice cube trays ready for freezing. This is such an adaptable recipe and really is as simple as throwing it all in the slow cooker and leaving it to cook. For a touch of heat add a pinch of chilli powder - take care though as the long slow cooking will intensify the heat. You will get better results from using a mid range brand of canned tomatoes, not the most expensive, but not the cheapest which can be watery and taste metallic. All slow cookers behave differently, the sauce may need more or less time depending on the wattage and if your cooker has any hot spots.